Happy Wednesday! 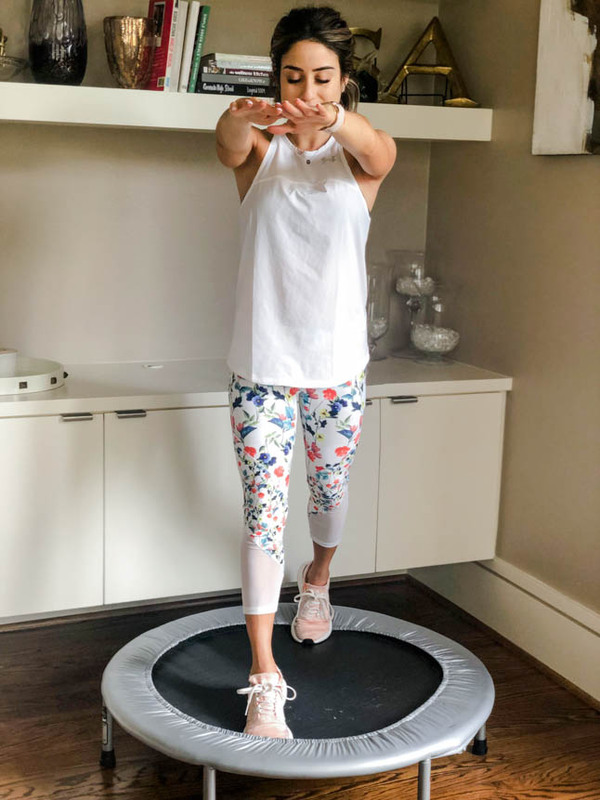 We are back with another Wellness Wednesday post for you, and we are so pumped to be sharing this rebounder workout with you, since SO many of you all have been asking! 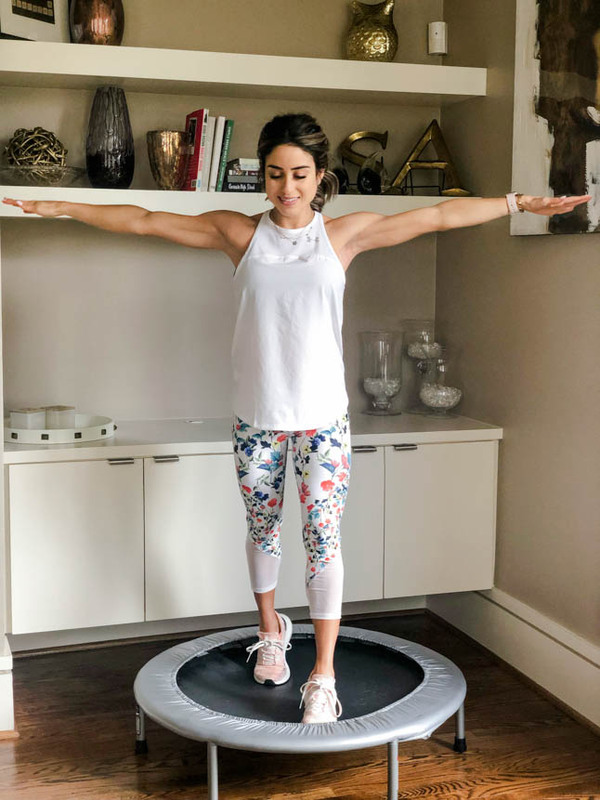 First off, we will answer a few questions about what the rebounder is and why it is good for you! We apologize for this grainy pictures, but we had to get them when we had time, haha. It is basically a fancy name for jumping on a mini trampoline! 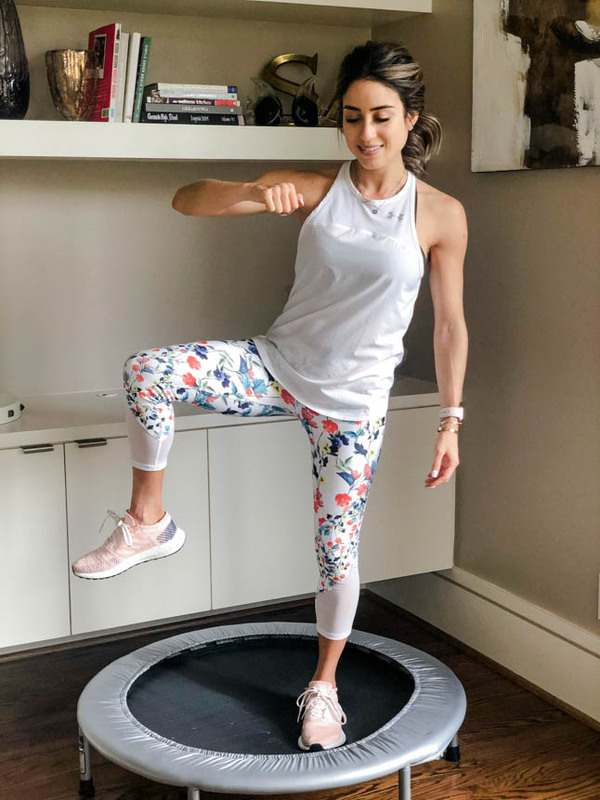 You basically bounce up and down gently, and you can do different exercises that move your legs and core! Also, best part is, you can do it anywhere! 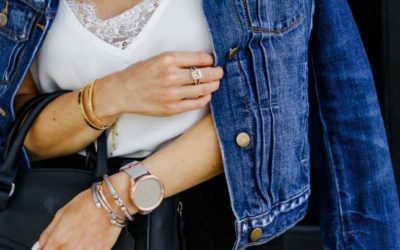 There isn’t much to it, but there are a ton of benefits that we mentioned below! We know it seems pretty crazy that such a simple exercise could be so effective, but it is. 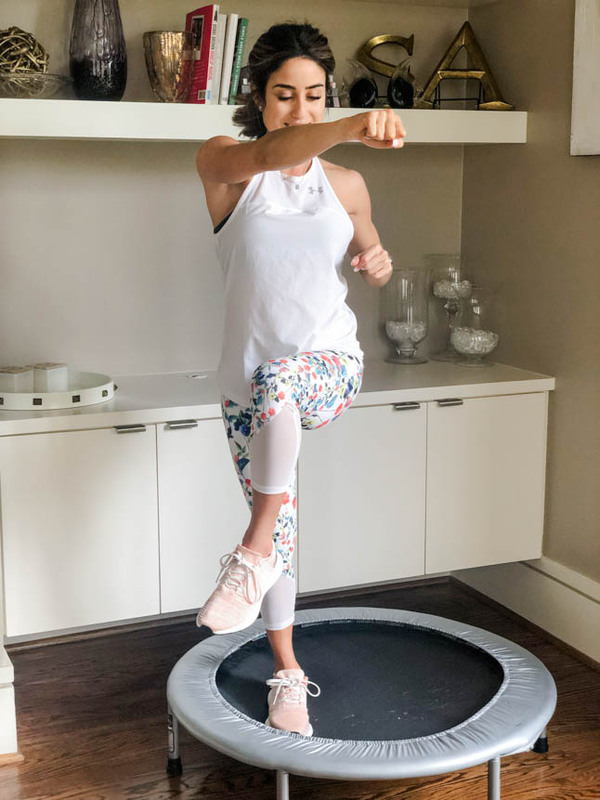 It is different than your other typical exercises because it uses the forces of acceleration and deceleration, making it work on every cell in the body! The up and down motion is beneficial for the lymphatic system since it runs in a vertical direction in the body. Speaking of the lymphatic system, we were getting lymphatic drainage treatments done for our health issues, and wish we had known about this exercise sooner! 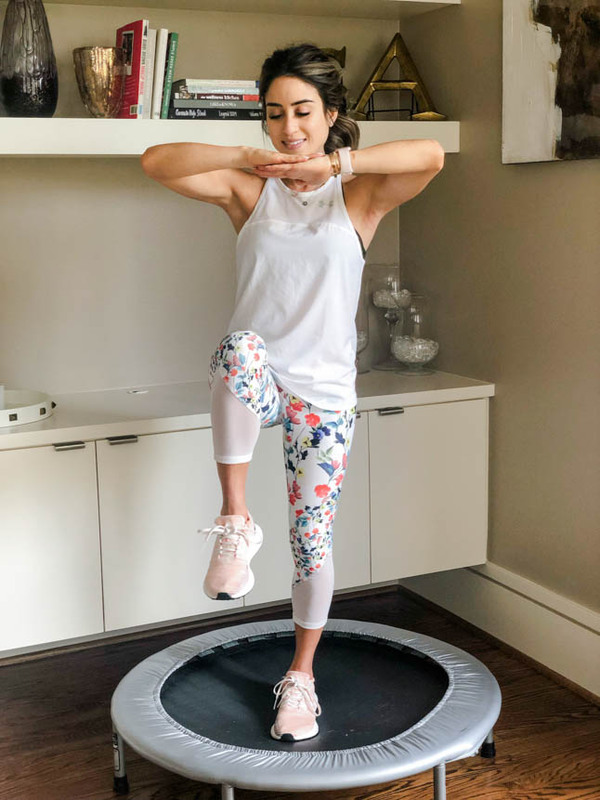 Another cool fact that we read up on is that NASA actually studied the benefits of rebounding when they were trying to find a good way to help astronauts recover and regain bone and muscle mass after being in space. They found that it was far more effective than running! Among a ton of other benefits, the most important one is that it is amazing for your lymphatic system. We are not going to get all scienc-y on here, but we we will share some links below if you want to do some research. If you’re like us, you love to do your reading and we get super nerdy and into it, haha. It basically strengthens your entire body: bones, muscle, tissue, and organs, and it is a lot less intense on your body and lower impact. Since we are all about doing exercises that are less harsh on your adrenal glands, this is perfect for us! There is not really a wrong way, which is great! You just step on it and jump and gently bounce around. We love putting on some music and having a mini dance party! You can also hold some 2lb hand weights and do some arm exercises. See some of our exercises in this blog post! It is not super easy, but you don’t feel it until you have been on there for a couple minutes straight. After 10 minutes, our heart rate is definitely up, and we start breaking a sweat! 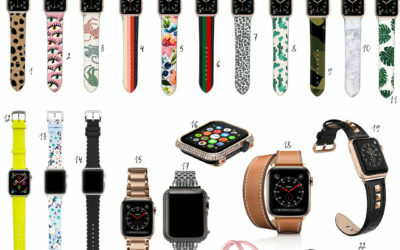 HOW LONG SHOULD YOU DO IT, AND HOW OFTEN? We have been doing it anywhere from 20-30 minutes every day or every other day. You can start off by doing 5 minutes a day, and then break it up into 5-minute intervals to make it so it is not so daunting. WHAT REBOUNDER DO YOU USE? We have this rebounder and love that it is so affordable! We love it, but since we have been using it pretty much every day, we are considering also ordering this one. As simple as it sounds! You can also move your arms and hold hand weights if you want to add something! For these, just position legs one in front of the other, and gently switch from leg to leg. While switching legs open and close arms to work those guns and shoulders! You could also use hand weights here! For this one, bring your knee up across your chest, and punch with the opposite hand! Repeat by alternating with both sides. Similar to the previous exercise, bring your knee out to the side and raise your arm above your knee to work your core. Hold your core tight as you gently do a crunch and alternate with both legs and arms.